Brilliant, sharply dressed Moravian with glossy blonde locks seeks frumpy Calvinist seminarian with an interest in exploring “total depravity.” Also likes long walks on the beach and salsa dancing. 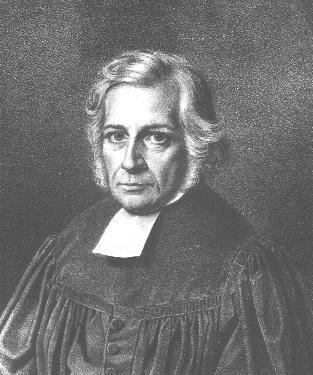 As I’m sure you all know,[iii] this 18th century German Enlightenment scholar and “father of modern liberal theology” was one of the most influential systematic theologians who ever lived, right up there with John Calvin,[iv] Thomas Aquinas, and Karl Barth. [v] I comprehend about 5% of what he writes. But here’s one thing I think I can accurately articulate. Religion, for Schleiermacher, isn’t about morals and it isn’t about elaborate cosmologies. It’s about personally intuiting our intimate and integral connection, as particular individuals, to the universe entire and eternal; this includes God, the natural world, and each other. Those capable of this kind of intuition are “religious” in a sense that seems very similar to our contemporary notion of “spiritual.” The totally cool thing about this theology is that it calls upon individuals to live their lives authentically, i.e. uniquely. Every thing in the universe is interrelated to every other thing in the universe. Since we each have our own limited and particular viewpoint, it is only by sharing our personal intuitions of an infinite God that we, as a species, stand any chance of understanding who and what God is. I love this definition of religion for several reasons. First off, it honors the entire human community, comprised of infinitely unique individuals, as essential to the very fabric of the universe. This seems a worthy alternative to Christianity’s long history of doctrinal tyranny, imperialism, colonialism, and sexism. Secondly, it’s an antidote to our contemporary notion of “spiritual, not religious,” which effectively rejects anything having to do with organized religions. Now remember, per Freddo, religion is about personally intuiting one’s own relationship to the eternal. So, for Schleiermacher, the true church is simply a group of people whose similar religious experiences give them a shared language with which to discuss their religious experience together. Two hundred years ago, Schleiermacher described why I’m a Christian today. In a nutshell, I’m a Christian because when I was five, I went to Sunday school and learned all the words I’d need to make sense of God in that particular way. I want to be in community with other religious people in a way that helps me tap deeper and deeper wells of meaning and relationship with God. I agree with Schleiermacher that there are an infinite number of ways to accomplish this, and believe me, I sampled a lot of them. After years of dabbling in Wicca and Religious Science, I realized that I had no interest in becoming fluent in another “religious language,” so I returned to my Christian roots and got back to the business of intuiting God with people who intuit God in the same way – through the life and message and miracles of Jesus Christ. As a religous person by temperament, I am confident that if I’d gotten my formative education in a synagogue or mosque, I’d still be there today. And that would be okay. Per Schleiermacher, another essential element to being truly religious is love for other people and their points of view. This is why most of my non-church friends are not Christians. As an introvert, I have to be selective about who I spend my time with and there’s only so much time outside church. This is also why I attend an ecumenical seminary and seem to gravitate toward the Buddhists, pagans, and atheists. I want to hear what they have to say, I want to see the universe through their eyes. Doing so never fails to help me clarify my own religious experience within my own vocabulary of faith. In this new year, I encourage all of my faithful readers to spend deliberate time with people who share their understanding of the infinite and people who see the world through very different eyes. Both are entirely necessary to a full experience of one’s place in the universe, regardless of whether God figures into your vocabulary. And bear in mind that for the truly religious person, every moment is sacred and every experience is church. [ii] Because I’m too commitment phobic to get a tattoo on a part of my body I can actually stand to look at. Because, you know, unlike marriage, tattoos are so…so…permanent. [iii] I’m totally kidding. Who the hell is Schleiermacher and how come I never heard of him? [v] I’ll leave it to others to add Charles Schulz to the list. Good day, good and faithful readers… those three dozen or so of you who stuck around like the handful of Israelites who didn’t go off fawning over the golden calf when Moses evaporated into the mists of Sinai for forty days and forty nights. Those happy few among the nation of Israel got to watch Moses lose his mind and lob the Ten Commandments into the air and grind up the golden calf, sprinkle it in a big old barrel of water, and make the other Israelites drink it. Things weren’t much better this week. Determined not to make the same demented hand gestures I did two weeks ago, I clung to the pulpit for dear life…and wound up flapping my elbows like a chicken desperate for lift-off. It has been a two month long voyage of discovery, my friends, during which I’ve experienced a significant crisis of confidence. Because the more I learn – about theology, Biblical history, pastoral care, and the intrusion of the subconscious on the sympathetic nervous system – the less qualified I feel to weigh in on matters of any import, let alone the matter of rescuing Christianity from banality, militancy, damnation doctrines, irrelevance, and just plain bad manners. Her point was that God never has any prime material to work with. If God is the potter and we are the clay, we’re not that awesome gooey clay that you get to launch off a wheel going 600 RPM through the nearest window. We’re also not that bitchin’ cool polymer clay that comes in thousands of colors. We’re certainly not the ultimate in clay craft – precious metal clay, which looks like gold and cooks up nice just like a Toll House cookie. We’re not even Play Dough. Because at least Play Dough is tasty. (Not as tasty as a Toll House cookie, though.) No, we’re that gritty poor man’s salt clay that they make you use in Sunday school class. My mother still owns a crappy clay star that I made when I was five, painted cobalt blue and liberally sprinkled with glitter. She hangs it on her Christmas tree every year. Why, I ask, why? Same reason God molds us, second-rate medium that we are. It’s got something to do with love. And love, I continue to learn, is as frequently inelegant as it is enthusiastic. So, here’s my goal. Get back to writing one blog per week…well, let’s say 2-3 per month. And to not be scared of speaking my mind, voicing my truth, and flapping my elbows. Thank you, constant readers, for your loyalty. I look forward to writing to you again SOON! I think this is the best demonstration of pure pique anywhere in the Bible. Anglicans don’t consider themselves Protestants, so if my Super Priest friend is reading this…the devil made me say it. WARNING! Do not fashion a golden calf out of this clay! It will look like total crap. For crafting idols, I advise using precious metal clay or the lost wax technique. 4 Comments	| tags: call, Christianity, comedy, discipleship, God, humor, religion, satire, seminary	| posted in The "Call"
In January, I preached my first wildly successful sermon to a throng of twenty in the rugged mountain town of Idaho Springs. I’d never laid eyes on any of the parishioners; they’d never seen me. But they took me under their wing and the day went off without a hitch. I get a warm, fuzzy feeling every time I think of it. This Sunday, I’m preaching for the first time at my home church. Several family members and friends will also be attending. Therefore, this has the potential of being a whole different ballgame. Jesus said, “A prophet is despised in his own land.” I interpret this to mean that you can’t reasonably expect people to take your message about the kingdom of heaven all that seriously when they have seen you trim your toenails in the living room, laugh hysterically at every fart joke you ever heard, and regularly scrutinize the scandal sheets for a glimpse of Colin Firth without his shirt on. * The people who remember the day you agonized over penning the perfect fan letter to Ricky Schroeder are not going to reflect somberly on your insights about the incarnation. The people who watched you inelegantly navigate the waters of post-divorce dating are probably going to react with skepticism when you talk about fulfillment in the body of Christ. And the people who applauded the alternative “ecumenical” lyrics you wrote to John Rutter’s “I Believe in Springtime” (repurposed as “I Believe in Zombies”) aren’t going to give a second’s thought to how much time and care you spent selecting thematically integrated hymns this worship service. Well, at least I know what I’m up against this Sunday. Maybe I should work a fart joke in, just so everyone knows I’m not getting above myself. * It’s been almost a year since I started this blog and I finally got a Bridget Jones reference in. She shoots, she scores! Oof…fell off. 1 Comment	| tags: Bible, call, Christianity, church, comedy, discipleship, humor, Jesus, satire	| posted in The "Call"